Mommy and Baby food: A Thrown Together Lunch for Mommy and Daddy That was Totally Delicious! A Thrown Together Lunch for Mommy and Daddy That was Totally Delicious! I love the meals that are created after looking through the fridge and thinking you have absolutely nothing. These dishes end up being the most creative and sometimes most delicious meals. Yesterday my husband and I realized that we forgot to go to the grocery store that morning, and now it was 1pm and we were way too hungry to venture out for food. 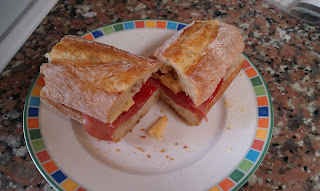 So after looking through the fridge and freezer we came up with these two sandwiches that were actually really yummy! 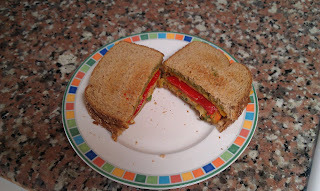 Cook veggie burger and then put all ingredients on toast and enjoy!